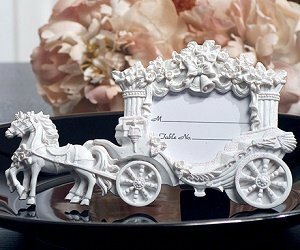 This ornately designed and detailed white resin place card frame showcases a pair of beautiful horses drawing a fairytale wedding coach. Each frame measures 6" x 3.5" and will hold a 2" x 3" photograph where your guests can display cherished memories after the event. A terrific addition to Cinderella and fairytale themed weddings and events. Place cards included. I would like to know if you order them and they are not available on May 30th can your order be canceled? Yes, you can cancel it as long as the order has not been shipped out. Please contact us via phone, email or chat if you need to cancel an order. 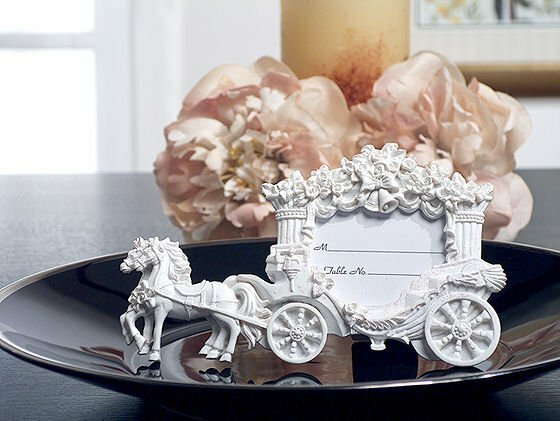 Does this carriage place card holder come in gold? What size are the seating cards in the white horse & carriage place card seating frame? The Wedding Coach White Finish Place Card Frame can hold a 2" x 3" photo or place card. They're approximately 2 x 3.